Is your iPhone’s wifi is not turning on? If your iPhone has been connected to any network before, your iPhone will connect to that wifi automatically but when you opened setting and go to wifi to see what is going on there and found that wifi button is grayed out and you are unable to turn it on or turn it off, what to do. Here are some real fix of this error. If the Bluetooth is also not opening of your iPhone and when you go to setting and open Bluetooth you found that Bluetooth could not detect any device. In this article, I have mentioned several ways to fix the wifi problem. I have mentioned some other software problem and the links are given between article. You can click on the link to read it. Now let’s know how to fix if Wifi won’t turn on in iPhone. If your iPhone’s Wifi is not turning on, just read this article. If your iPhone’s grayed out, it means your phone has a hardware problem. It is your WiFi antenna which is not working properly. In every phone, It is headphone jack that act as a antenna of WiFi. Sometimes when a liquid enters in headphone jack or because of some debris, the antenna gets short and it stops working. If you are using iPhone’s old model as iPhone 4 or 4s, you will see a white dot at the bottom of the headphone jack. A grayed WiFi can affect any iPhone model as iPhone 4, iPhone 5, iPhone 6, iPhone 7, iPhone 8 or iPhone X but in this, some model don’t have headphone jack. So let’s know how to fix WiFi Won’t turn on in iPhone. First of all, we have to determined that Antenna is damaged or not because if antenna is damaged, you can not repair it at home but if it is not damaged, you can fix it at home because it is a software problem. So let’s know if your iPhone’s WiFi antenna is damaged or not. To determined it, you have to follow the following steps. First of all, take a flash light or a torch to see into the iPhone’s headphone jack. If you see any debris or any other element in your iPhone’s headphone jack, just take a brush and clean it. If you have iPhone 4 or 4s, you will see a white dot at the bottom of the headphone jack. If it has been got red, it means any liquid substance has get into headphone jack and it got short and you wifi antenna got worse. Now if the dot is still white or there is no debris, may be it is a software problem. So let’s know how to fix a software problem if why wifi won’t turn on in iPhone. Every type of software problem can be eliminated by resetting the iPhone. To reset your iPhone, just follow the following step in your iPhone. Tap on the General Setting. Now Tap on the Reset Network Setting. Now you have reset all network setting before resetting all your network, you have make sure that you knew all wifi password because after reset all network, everything will be erased as all saved wifi password and paired Bluetooth device. Now reconnect the device to WiFi. If it is working and it has connected to the network, you have repaired the iPhone. If you are still facing the problem, it is a hardware problem and the antenna has got damaged. As Apple don’t repair the Antenna, you have to exchange the iPhone if you want to connect to the internet by WiFi but if your iPhone is under guarantee period, just go to Apple care and tell him about your problem, they will surely help you and they can exchange your iPhone by a new iPhone. You can also repair your iPhone by third party technician, just call any technician and tell him about your problem and ask him if he is able to repair your iPhone or not. If he said that he cloud, just go to him or call him. They can surely make your iPhone Wifi antenna. So this is the way by which you can repair wifi. 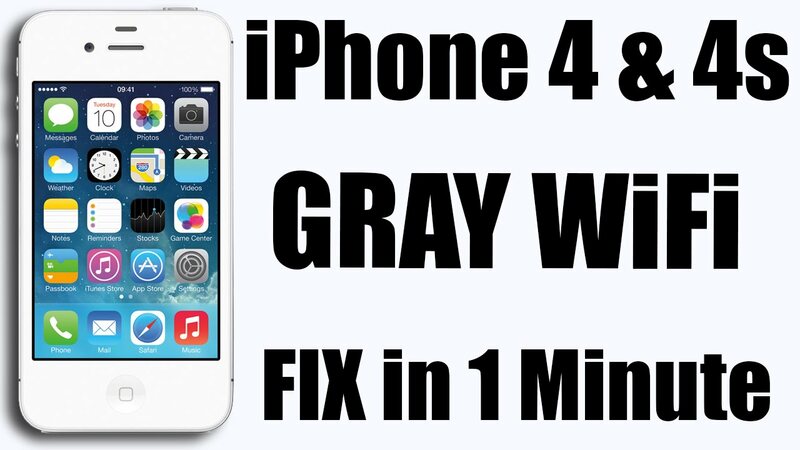 Tell us through comment box if you are able to fix wifi or not and also mention by which way you fix your iPhone. If there is any other software problem in your iPhone, just mentioned below. We’ll surely help you. Thank you. This entry was posted in Best iPhone Tips and tagged can't turn on Wifi in iPhone 4, can't turn on wifi in iPhone 4s, iPad wifi grayed out repair, iPhone 4 wifi button not sliding, iPhone 4 wifi disabled, iPhone 4s wifi grayed out permanent fix, iPhone 4s wifi not conecting, iphone 4s wifi not connecting, iPhone 4s wifi not turning on solution, iPhone 6s wifi grayed out on November 22, 2017 by Shubham Pandey.